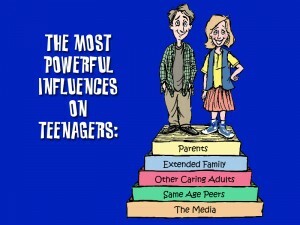 Who or what is the most powerful influence on teenagers? Who do teenagers look up to most as role models? These questions (or questions similar to them) have formed the basis for dozens of studies on teenagers that have been conducted over the years. The issue of teen influence is heavily researched because marketers are well aware that teenagers control an estimated 300 billiion dollars per year of discretionary income. They also know that if you can sell a teenager on a brand or product while they are young, there’s a strong likelihood they will remain loyal for the rest of their lives. That’s also one of the reasons why I believe so much in youth ministry. Lifelong disciples of Jesus are more often than not called while they are teenagers. That was true for me as it was for a number of Jesus’ original twelve. So another study on teen influence has been conducted (this one by the Barna Group) and the results of that new study were just released. The good news for me is that I won’t have to revise any of my teaching notes on this subject anytime soon. Well, I may need to update the clothing styles on the kids on our graphic at the right, but otherwise, everything stays the same. For as long as I can remember I’ve been teaching and writing that the most powerful influences on teenagers are not (as some might suppose) the entertainment media and same-age peers. 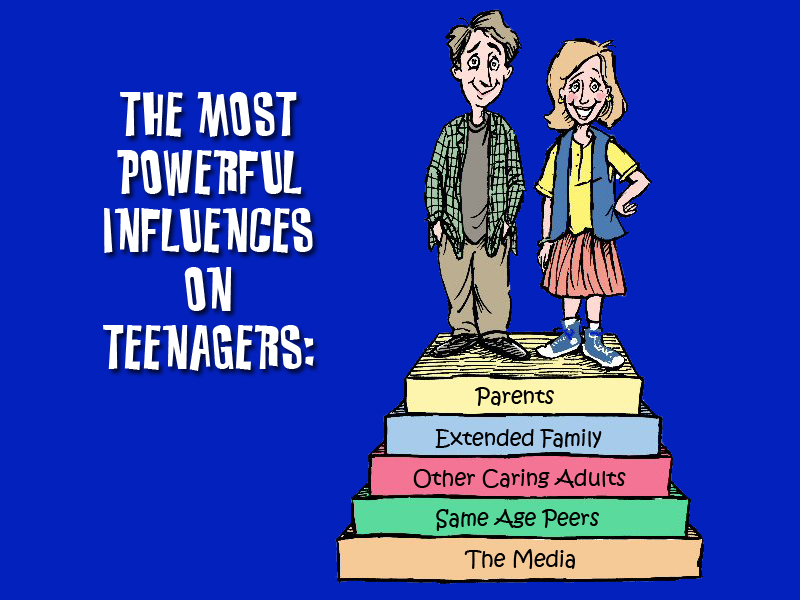 The primary influences on teenagers are (1) their parents, followed next by (2) their extended family (grandparents and other close relatives), then (3) caring adults like teachers, coaches, youth ministers and others who care enough to come alongside them in some meaningful way. This was not only true for me personally but it was confirmed by several studies that were conducted almost thirty years ago. Their answer? The most commonly mentioned role model according to this new study is a relative, most typically a grandparent. Next on the list—you guessed it—teachers and coaches. Way down the list (after people they know personally) come celebrities, politicians, sports heroes, musicians and the like. Who influenced you most when you were a teenager? This entry was posted in Ministry and tagged influence, research on teenagers, role models, Teenagers, understanding your teenager, youth ministry. Bookmark the permalink. Great Content! Thanks, Wayne, for sharing this info to us @ New Braunfels, TX this weekend. The New Braunfels Youth Network was highly privileged to have someone with so much Bluegrass experience! Thanks Brandon … I had a great day in New Braunfels … my first time there. Hope you get lots of good feedback from the parents who were at the seminar. I had several good conversations with parents who stuck around after the seminar was over. Blessings to you all … hope I can come back sometime.